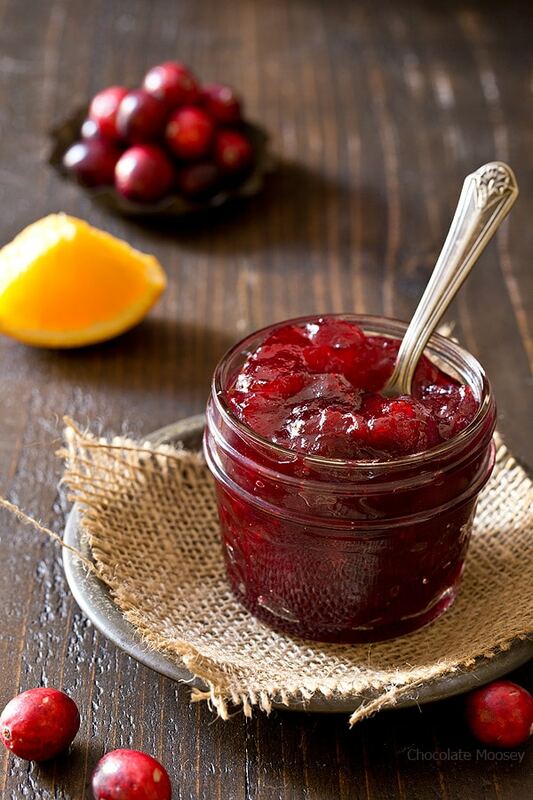 Whether you’re making Thanksgiving for two or don’t want a ton of leftovers, this small batch Homemade Cranberry Sauce made with fresh orange juice and zest will brighten your dinner table. It’s almost Thanksgiving! Do you serve cranberries with your turkey or Cornish hen? I’m not talking about the can-shaped jelly nobody wants to touch. 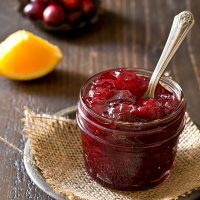 I’m talking about Homemade Cranberry Sauce with fresh cranberries cooked down into a sauce with orange juice and zest for a nice pop of flavor. Actually I’m not sure why it’s called a sauce as it reminds me more of a jam. Names aside, it adds a nice touch of sweetness to a savory meal. What’s special about my recipe is it only makes a small batch of 2-4 servings. That’s ideal if you’re making Thanksgiving for two or if only a few people enjoy cranberry sauce. It’s also incredibly easy to make. Boil everything in a saucepan until thick, which is about 10-15 minutes. That’s it. Done. You can make it while the bird is cooking. You can make it the day before and warm before serving. You can even make it on Monday and keep it in the fridge until Thursday. How’s that for planning ahead? Can we talk about how I’ve never had fresh cranberries before this recipe? My only experience with cranberries is from a can. I remember my parents opening a can of cranberry sauce for Thanksgiving, and the sauce (“sauce”?) kept the shape of the can. I think I’ve had cranberry juice once or twice in my life but not enough to tell you what cranberry tastes like. Until now. I decided to eat a fresh one straight from the bag and let me warn you – don’t do that. They are extremely tart, much like rhubarb (never had raw rhubarb? Yea you don’t want to taste that one raw either). Although cranberries are very tart on their own, balancing them out with sweetness makes them much more enjoyable. What ingredients are in cranberry sauce? To make homemade cranberry sauce, the ingredients are fresh cranberries, sugar, fresh oranges, cinnamon, and a big pinch of salt. For the orange juice, I highly recommend buying oranges then squeezing fresh juice from them. It tastes so much fresher. However, if you want to use bottled orange juice, make sure it’s either unsweetened or adjust the amount of sugar in the recipe. 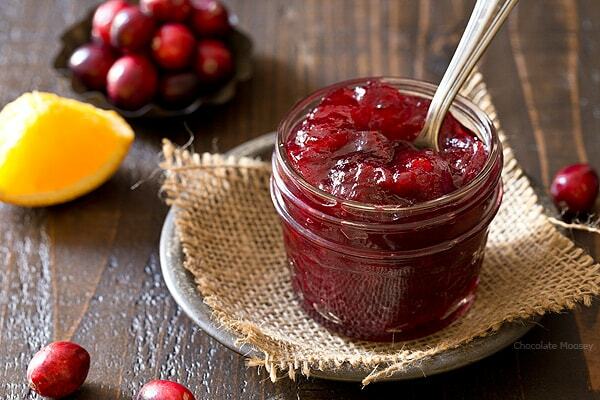 How do you make cranberry sauce from scratch? 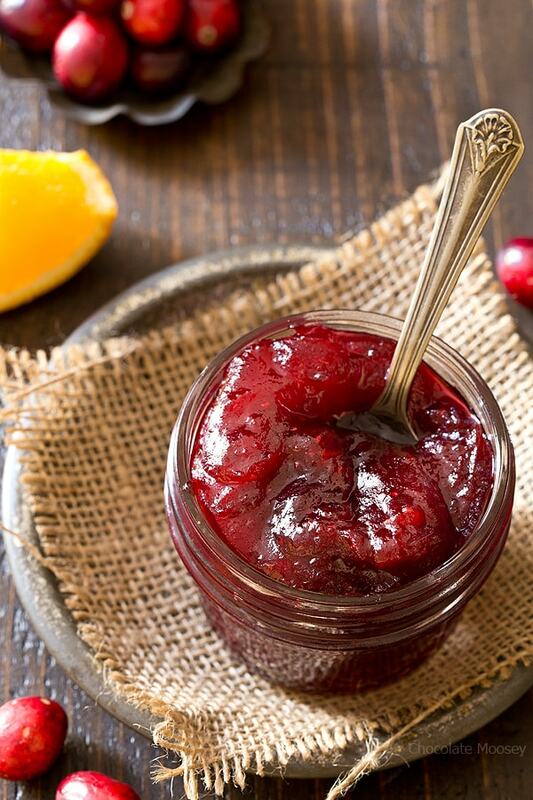 Making homemade cranberry sauce is as easy as boiling water! You bring all of the ingredients to boil then cook until the fresh cranberries break down into a sauce. Seriously so easy. The best part about making fresh cranberry sauce from scratch is you can make it ahead of time! 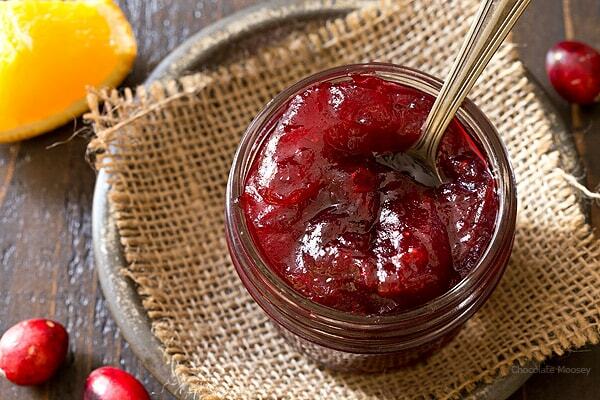 Homemade cranberry sauces lasts up to 2 weeks in the fridge. Since this homemade cranberry sauce recipe only makes a small batch, you can freeze the remaining cranberries. Lay them out in a single layer on a rimmed cookie sheet, freeze for about an hour or until firm, then transfer and seal them in a freezer bag. They’ll stay almost indefinitely frozen (or until they get freezer burned). In addition to Thanksgiving dinner, cranberry sauce pairs well with a variety of creamy cheeses, including Brie, Gouda, and cream cheese. Make a grilled cheese using Gouda. Top it on some baked Brie. Slather it on top of crackers with cream cheese. In a large saucepan, whisk together the cranberries, sugar, zest, juice, cinnamon, and salt. Bring to a boil. Once boiling, cook for 10-15 minutes or until cranberries have burst and sauce has thickened. Cool to room temperature before serving. Store up to 2 weeks in the refrigerator. *For the orange juice, I highly recommend buying oranges then squeezing fresh juice from them. However, if you use bottled orange juice, make sure it’s either unsweetened or adjust the amount of sugar in the recipe. I AM MAKING THIS FOR THANKSGIVING, IT LOOKS DELISH! I WILL TELL YOU WHAT WE THOUGHT OF IT, I LOVE SMALL BATCH RECIPES! I have a wonderful recipe from a very old cook book that calls for orange zest, a cinnamon stick and apples. Everyone loves it . Even those who thought they did not like cranberries. Similar to your recipe but with apples in it. Oh are the apples cooked in a similar matter so it’s like cooked apples (I guess an apple “jam” if you will)? Or is it more like applesauce? I have tried cranberries. Can I use those in the recipe? Sorry it’s a typing error. I meant to say I have dried cranberries, can I use those in making this recipe of cranberry sauce. Definitely up to 1 week in the refrigerator, possibly 2 weeks if you check it before serving. This was fantastic! Just made it, and it is still warm on my counter. I used zest and juice from two clementines as that was all that I had on hand. A couple shakes of salt and cinnamon. Wonderful! Tasted like and had the texture of jam. So excited to serve it tomorrow for Thanksgiving! Thank you! Clementines work too! Happy Thanksgiving and enjoy! This looks so fantastic thank you for sharing! This will make a great gift as well. I’ll be making this one today to share for Thanksgiving. Love the small batch! Our kids are all grown & gone so it’s just my husband & I at home for Thanksgiving. Not loving the canned cranberry, I always look for recipes to replace the delicious treat I only get once a year. The problem is the recipes typically serve small armies. This one is very well suited for one person, maybe 1 1/2. I would definitely double this recipe if you intend to feed two people. My husband doesn’t like cranberry sauce of any kind so this was perfect for me. I didn’t have oranges on hand but I have Meyer lemons so I used them. I zested 1 1/2 lemons & juiced both. Not quite a full 1/2 cup but it was very close. I used dark brown sugar over white because the added sweetness from the molasses makes the sauce very tasty & it sets up really well. This is an incredibly easy recipe for 1-2 people. Thank you for your feedback! I think the serving size is heavily dependent on how much each person eats and what else you’re serving with dinner. There’s no way I could eat the whole amount myself as 1 serving! But it sounds like you love cranberry sauce, which is good feedback for others who are deciding to make this. I like your use of brown sugar. I’ll have to try that myself next time! Happy Thanksgiving! AWESOME! I DIDN’T CHANGE A THING AND IT WAS A FAMILY HIT. THE BEST I’VE MADE TO DAT AND I;M OLD! LOL! Happy to hear you enjoyed it, Karen!